I’ve chosen an initial map, which is still subject to adjustment, but for now I’m charging on. Time to place major landmarks and sites, even if I don’t know much about them yet. I’ll be leaning on Kevin Crawford’s An Echo, Resounding: A Sourcebook for Lordship and War for parts of this. I don’t plan to use the demesne-level play elements of it at this point, but there is still some quite valuable information there without those rules. The region Kevin describes in An Echo, Resounding is about 40,000 square miles, same as mine. This is almost a coincidence (I wasn’t trying to match his example, but it felt like a good size to work with and when I opened the book, there it was). A very small number of cities (probably one, or maybe two; there might be three or four for ‘particularly populous or well-developed lands’). Four towns per city, spread fairly evenly across the region. Five ‘great ruins’ per city. There will likely be lots of ruins around, these are the major (biggest and/or most interesting) ones. Some will likely be former towns or cities, so put them where you might expect to have found such settlements. There are other types as well that may be harder to find. Place a number of ‘resources’, locations of particular interest or value, equal to the number of towns. Try not to put them too close to existing settlements because that will make them easy to exploit and reduce ‘interesting struggle for control’ over them. Place lairs wherever they seem to make sense — places they can prey on travel between settlements, control resources, or just fill in (and explain) gaps that otherwise appear in the coverage of the map. Plan, but do not place, the number of cities. The design of this map lends itself to having one city on each major landmass. I have not yet decided where they will go, but the two bays opening to the east (one on the north side toward the west end of the strait, one on the south side about 1/3 from the eastern edge of the map, next to the three mountains) are likely candidates. It occurs to me, however, that the larger bay in the south, facing east, might make a good segue into another region entirely. Start from the north, and when the party makes their way to that port, they can find themselves going somewhere else entirely. Something to think about. Place about eight to ten resources appropriate to the terrain they are on. I am somewhat inclined to simply roll randomly. 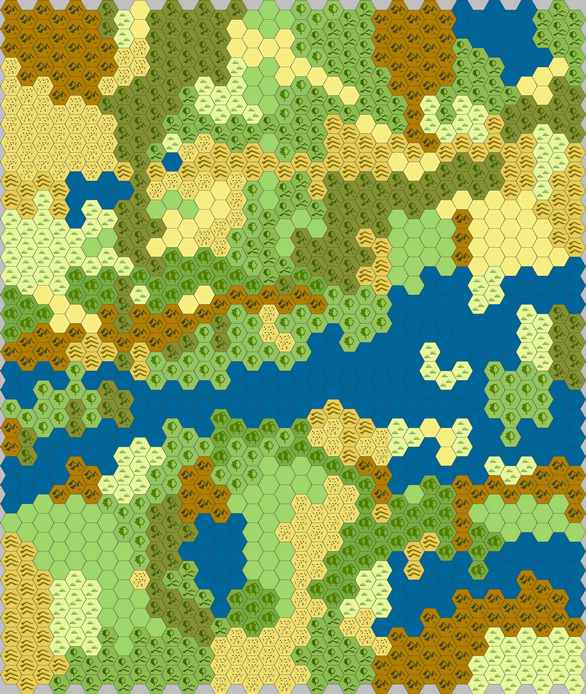 Place about eight to ten towns to take advantage of both natural resources (terrain and rivers — which are not yet shown on this map, I’ll need to fix that) and the special resources. Place about ten to fifteen ruins. This is a little more liberal than Kevin’s guidelines, but even the cities, towns, and resources account for only 18-22 of the 1,296 hexes in this map. I think I can afford the space. Spread as evenly as possible each settlement will have somewhat more than a hundred hexes dedicated to it, or in other words the settlements are likely to be about sixty or seventy miles apart. The biggest difference is that the towns will be placed to take advantage of the resources where possible. This will involve some more dice rolling than I plan to do tonight (it’s getting late and I get up early tomorrow), but my next step will be to start determining some information about the various landmarks and sites so I can start placing them in likely locations. Also, I generated a list of adventure names (such as the 500 Random Old-School Adventure Sites I posted a while ago). In fact, I generated several such lists and culled it down to a set of fifty. I will want to start matching them to the various landmarks and sites as well. It seems to be the common practice to scatter towns and villages over the entire sandbox map, a la Wilderlands. I prefer the approach from Isle of Dread, with all the settlements clustered fairly close together at one end and the rest of the map wild. My last wilderness crawl was admittedly not particularly well planned in advance, but I put the big city right at the west edge and scattered the other settlements in sharply decreasing frequency further east. I like the added challenge of higher level parties penetrating deeper into the wilderness and then having to get their treasure safely back to civilisation. Making friends with those lonely castles and hidden demihuman villages becomes that much more important. Plus it meant I didn’t have to key the whole map in advance.